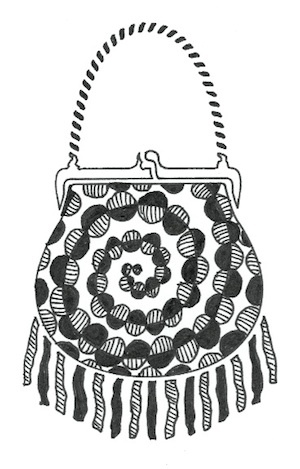 Holiday Zentangle® and Gelli print T-shirts. 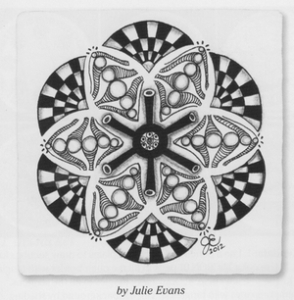 View a YouTube, add touches of the holidays all through the house with these easy-to-do Zentangle Trees. 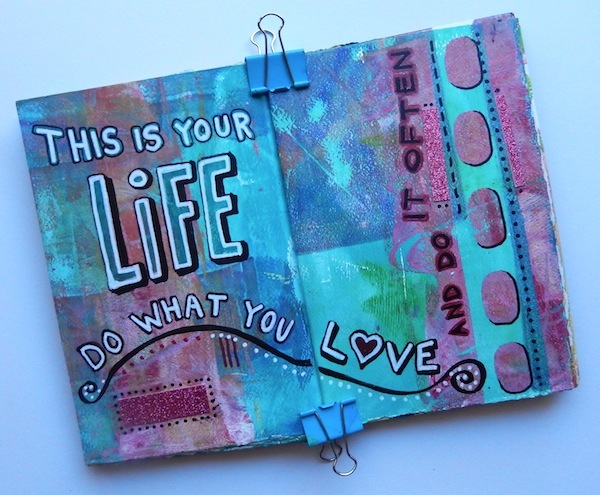 Gelli Printing is one of my favorite painting techniques and it is so much FUN! 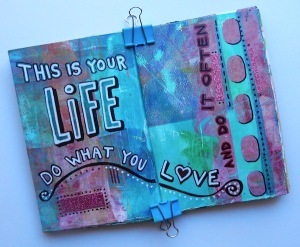 I love to demo and teach with my Gelli Arts® plate. Recently I was doing a short demo to a group of friends at an art retreat and got a BIG SURPRISE! When I mentioned that Gelli printing worked equally well on paper and fabric, Teresa’s eyes lit up. “Could I do it on my plain t-shirt?”, she asked. 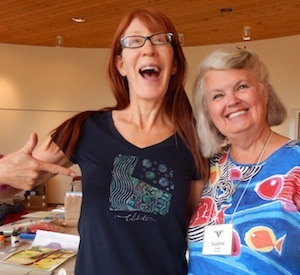 With my answer of “sure” – Teresa took off her shirt (it was an all women’s retreat), chose her colors and textures, positioned her shirt on the Gelli plate and Walla! – we printed her shirt. Look for Teresa around San Diego, CA. You’ll recognize her by the shirt! 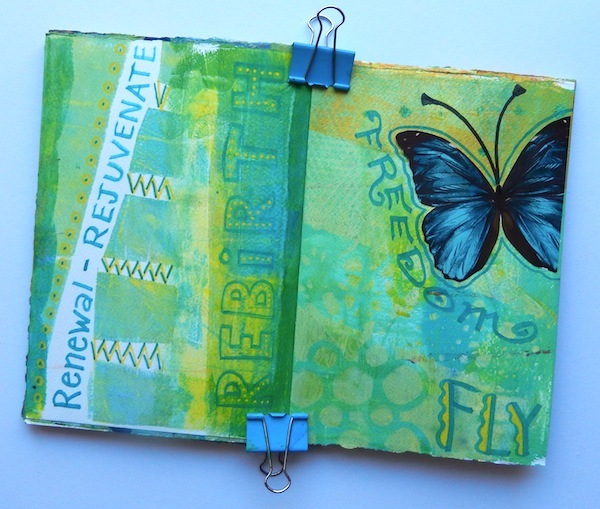 Gelli printing in my art journal. 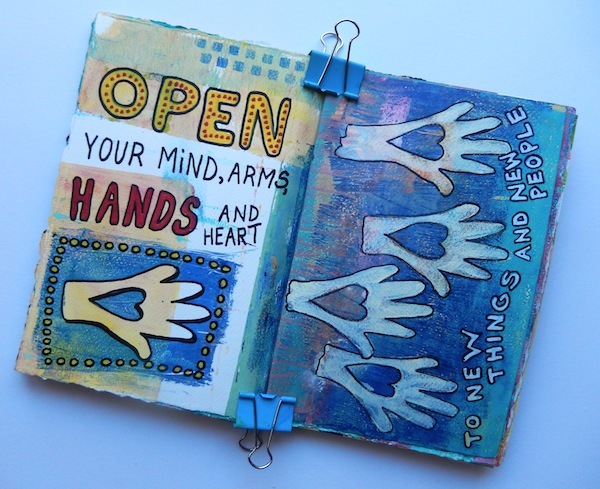 I love to print colorful textures and pages as the ‘starts’ for pages in my Art Journal. Then I add favorite quotes with a bit of simple collage or stencil illustrations. See some of my favorite quotes above. 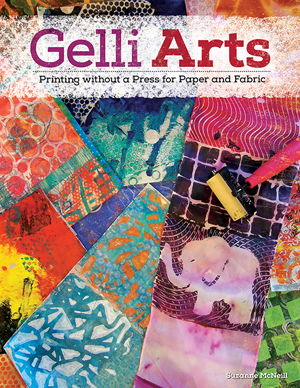 Check out my book on ‘Gelli Printing’. 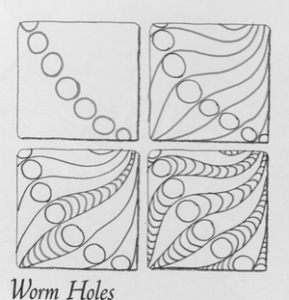 Half of the book is how-to-do-it and the other half is what-to-do-with-your-prints. View a YouTube, easy to make – perfect for the season, wooden Zentangle® ornaments. 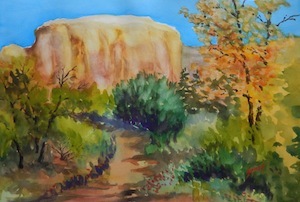 Recently I returned from a special trip to Ghost Ranch, a magical place which inspires artists, writers and other visitors year long. It was Georgia Okeefe’s favorite place to paint… how joyful to be able to trace her footsteps and surround myself with fellow artists, visions of majestic mountains, cliffs, wildflowers and nature. The rustic setting took me back in time to camps I attended as a child, and camp counseling in Colorado when I was in college. 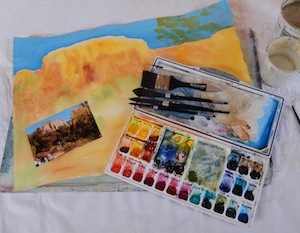 It was the second time I had the opportunity to participate in Darla Bostick’s Art Workshop, held each year at Ghost Ranch. I spent the entire week painting, my palette is filled with my favorite watercolors… QoR from Golden paints. I LOVE these paints. They stay moist and re-wet with just a quick spray of water. Best of all, the colors are luscious and keep their vibrancy even when dry (unlike many other brands which lighten as they dry). I loved recording the vision of cottonwood tree leaves turning yellow gold, the purple and blue hues that appear on the mountains, and the colorful gardens of nature. 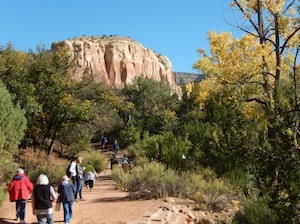 If you are yearning to spend time in the great outdoors I recommend a trip to Ghost Ranch. 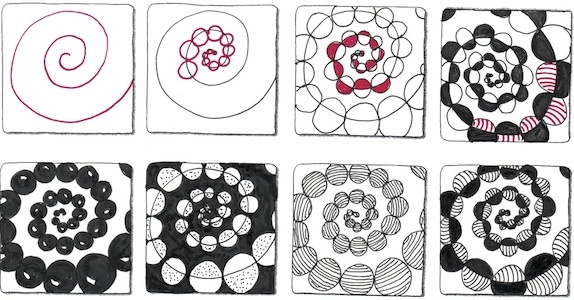 It is a safe and welcoming atmosphere, helps you get back to basics and realize how little you really need to be happy.